Seyi Omooba, who had been due to play the lead role of Celie in the musical, made the assertion in a 2014 Facebook post that resurfaced last week. "Following careful reflection it has been decided that Seyi will no longer be involved with the production," said the show's producers in a statement. In her post, Omooba said she did "not believe you can be born gay". "Do you still stand by this post? Or are you happy to remain a hypocrite?" wrote Hamilton cast member Aaron Lee Lambert. Omooba, wrote last week that she felt "excited and privileged" to be part of the production. The BBC has contacted her representatives to request a comment. The two theatres staging the show - the Curve in Leicester and the Birmingham Hippodrome - said the actress's comments had "caused significant and widely expressed concerns both on social media and in the wider press". 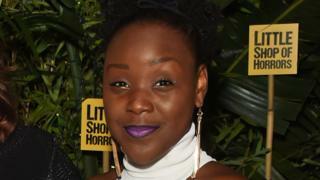 Omooba, who trained at the Mountview Academy of Theatre Arts, recently appeared in Hadestown at the National Theatre and Little Shop of Horrors at the Open Air Theatre in Regent's Park.